Product #60835 | SKU XSW-D PRESENTATION BASE SET | 0.0 (no ratings yet) Thanks for your rating! A deposit of $50.00 is required for this pre-order. The Sennheiser XSW-D PRESENTATION BASE SET is an easy entry point into the world of wireless microphone audio for speakers, educators, panellists, and moderators looking for a stage-ready system that's both cost effective and simple to use. It puts world-renowned Sennheiser wireless sound quality in a miniaturised, plug-and-go, 1-button digital system that anyone can operate. Plug it in, power it up, and you're immediately up and running, streamlining your setup so you can concentrate on delivering your message to your audience with confidence. 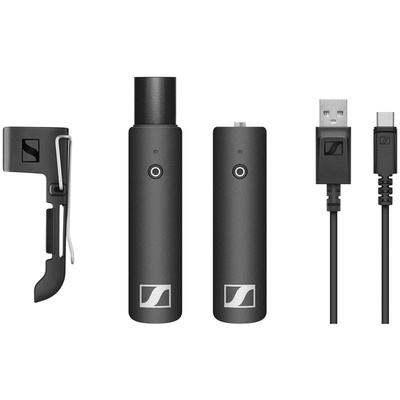 The Sennheiser XSW-D PRESENTATION BASE SET comes with a bodypack transmitter ready to be used with either a lavalier or headset mic of your choice, giving you the hands-free convenience of a clip-on microphone. The XLR-equipped, plug-in receiver connects to a wide range of professional audio gear including mixing boards and portable PA systems, allowing you to capture crisp-sounding speech in lecture halls, houses of worship, or conference rooms. The exceptionally lightweight and compact bodypack transmitter lets you connect a Sennheiser or Sennheiser-compatible lavalier or headset mic equipped with a locking 3.5mm connector. The transmitter is designed to only transmit signal from a mic (not from a mixer or recorder). The transmitter can be easily concealed in your pocket or discreetly attached to your waist with the included belt clip. Plug the compact receiver directly into the XLR input of your audio mixer or PA, and you're ready to turn the system on. The receiver cannot be phantom powered by a mixer. It needs to be charged ahead of time or used while being charged via USB. Nothing ruins a take like hearing the weather report coming through your mic. Unlike traditional analogue wireless systems, the XSW-D digital system operates in the 2.4 GHz ISM band, away from interruptions and dropouts caused by TV and radio channel interference. Thanks to Sennheiser's channel allocation and interference management technology, the system selects the best operating frequency and automatically switches to a clean channel to provide reliable transmission at a distance up to 250' line of sight. The functionality of this XSW-D PRESENTATION BASE SET can easily be expanded by adding XSW-D Series transmitters and receivers, as your needs evolve. With this set, adding the XSW-D XLR female plug-on transmitter allows you to connect a dynamic handheld microphone for situations when the mic needs to be shared between speakers or passed around in the audience. Because the XSW-D system operates in the licence-free 2.4 GHz band, you don't have to worry about local licencing laws, frequency coordination, and other technical hassles. Simply let the system pick a channel for you, and start the presentation—whether you're working at home or anywhere in the world.